Three years ago, I had a really cool business idea that I fell in love with. I spent 5 months developing it before realizing that it's crap. Right from the beginning I felt that no one was willing to pay for it, but I just kept kicking the can down the road by designing logo, website, etc. Several months later when I finally tried to sell my product, my expectations were confirmed. Nobody would buy it. "Why the hell did I lose so much time on this idea" I kept asking myself. Trying to avoid the same mistake, I decided to turn my entrepreneurial process upside down. Since then, I've used the system explained in this article to win customers for my ideas even before I had the product. 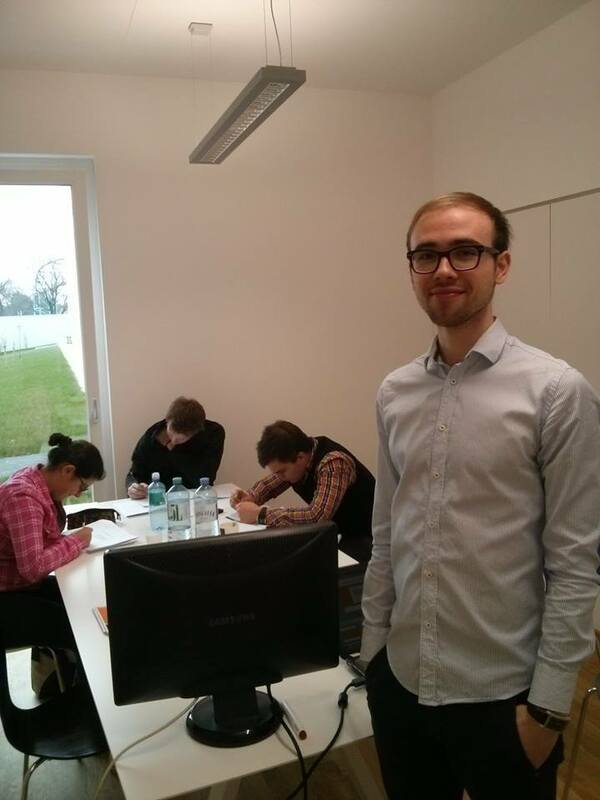 The first three customers that helped me validate my last business idea - GMAT Vienna. In my last idea, which I have tested together with a colleague Patrick, we did some basic research, developed the prototype and sold the product (before it was developed!) in less than 10 hours. Our logo was basic, we didn't have a website (and still don’t) and we did not register a company, however, we got the first 5 customers and earned 150€ in one working day. The system for validating and starting business ideas consists of three parts. Mini-research serves as a first line of defense against bad business ideas. We don't want to spend any time on ideas that are doomed to fail. As a part of your mini-research, you should do three things. Second, create a basic business plan with the Google Spreadsheet. Here is my spreadsheet you can use. The first sheet is an example and the second one is for your idea. Every minute you invest in this business case can potentially save you hours down the road. Realizing early that the potential revenue of your business idea is not even big enough to pay for your yearly fitness membership, can save you a lot of time that you could spend on a better idea. Click here to download the spreadsheet (File/Make a copy). Third, look again at the competitors' products on Amazon and search for 2, 3 and 4-star reviews and use them for improving your business idea. These reviews are usually written by customers who provide in-depth opinion and explain what is good and bad about a competitor's product. This will give you a pretty good understanding of what people want and need in a product of this type. Is someone saying that a competitors' product is too complicated? Well, let's use this information to improve your product. We, entrepreneurs, tend to have a vision of a final product in our heads and we are not ready to start a business before everything is perfect and exactly as we've envisioned it. It's definitely great that you have a vision because that’s how you know where you want to go, but it can also prevent you from starting a business because it feels overwhelming. Instead, let's try to build the simplest version of your idea and see if anyone is interested in it. So far, I've developed prototypes of four types: (1) mock-up, (2) pdf, (3) video, (4) landing page. (1) Mock-up is a very basic illustration of how a product could look like. Mock-ups are suitable for physical products, mobile applications, software, and services. Tools you might use: pen and paper, Google Drawings, Photoshop, Sketch, Balsamiq Mockups and SketchUp. And remember, you don't have to be fancy at this point. If you don't know how to design on a computer, just use pen and paper. The pdf used for the validation of GMAT Vienna. (2) You can create a short pdf, explaining the product or service that you want to offer. Pdf is suitable for events (to explain the program of the event), workshops, courses, conferences, etc. Tools you might use: Google Docs, PowerPoint, Word, iBooks Author, and Pages (Mac). (3) Video is suitable for more complex products that need more explanation (services, complex physical products). Instead of going all out and creating something beautiful but time-consuming, you can create PowerPoint slides, record your screen and talk through the video. Tools you might use: Camtasia, Youtube, QuickTime Player (Mac), PowerPoint. This method was used by the founder of Dropbox to test his idea. (4) Landing page is suitable for more complex products. I've put the landing page as the last option because it is quite complex and so can easily lead to procrastination. You can explain almost any idea or product with one of the three above-mentioned options. In case you are familiar with building websites and want to choose this option, you might want to use SquareSpace, Shopify, or QuickMVP. Share the prototype with potential customers and try to presell it. This is the most important step. Many ideas seem good on paper but do not perform well in real life. There is no better validation than earning some money! Remember, we don't want to spend months building a product, just to realize that nobody wants to buy it. Once you have validated the idea and you know that people are willing to buy it, you can still go out and create a product of your dreams. Start small, to grow big. I know that some of you are thinking: "How can sell the product that is not created yet?" Well, you can tell your customers that there will be a short waiting time while you get the product ready for them. You can wrap this message by saying that they are a part of the special first edition. How is this any different than a Kickstarter campaign? What is the worst that can happen? If during the production you realize that you won't be able to make the promised deadline, you can write to customers and ask for an extension. There are two ways how to presell your product. (1) Email 10 potential clients (they might be your friends). Prepare a nice short sales copy, attach a prototype and ask them if they are interested. If you get a positive answer, ask them to pay you via PayPal or bank transfer. Moreover, make sure that a text is written in plain English. Do not try to be too fancy; people trust authentic communication more than the professional. Here is a part of my sales copy for the GMAT Vienna. (2) Use Facebook chat to reach out to 10 potential clients. Prepare the same components as for the email option mentioned above (a sales copy and a prototype). How can I presell the product or service if I don't have a company? There are two solutions to this problem. First, you go totally ghetto and just presell without any invoice. You know you will open a company if an idea shows promising. Second, you can ask a friend, which owns a company or another entity that can issue invoices, if he could do you a favour and issue invoice for several products. Yes, it might be problematic to get the cash out of the company's bank account to yours, but if you want to be an entrepreneur I am sure you will find a way. This is all great Alen, but this approach is not suitable to my idea. If you are working on the next Tesla or a spaceship project, this approach might be hard to implement. However, I believe that the above-described principles can be applied to 97% of all business ideas. Don't try to look for excuses and reasons why this wouldn't work for your specific idea. If you do so, you will definitely find a reason not to do it and just procrastinate or complicate further. Rather try to think creatively how you can transfer the principles to your example and come up with new tactics. Enter your email to receive a note from me when I write smt new.